Hello, there! Here are Greg, Liz and Steve with the new Pendoflex high aspect twin that Steve built for Greg. 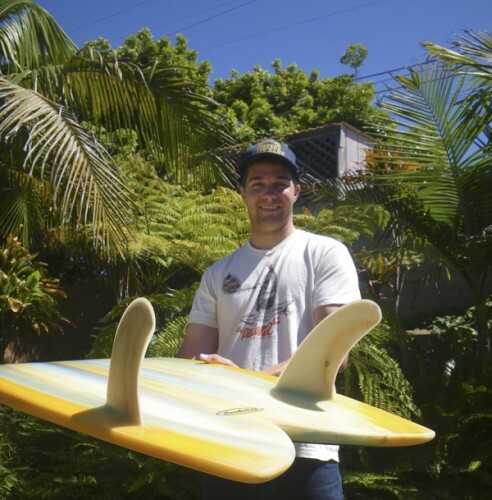 Steve shaped his sweet twin fin by hand with care, out of EPS foam and glassed it with epoxy resin. The fins are a special custom template specifically for this board and are shaped from baltic birch. 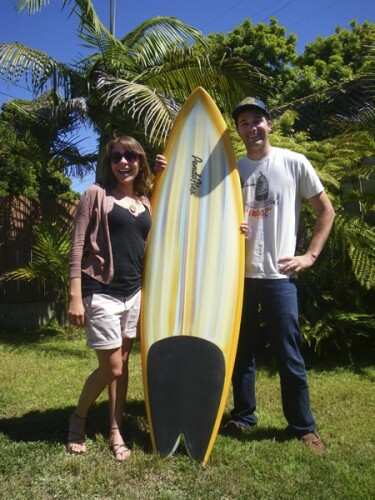 The Pendoflex high aspect twin’s dimensions are 6′2″ x 20.” We all had a fun time when Liz and Greg came to visit and picked up the board. We’re so stoked! Thank you Greg for sharing your stoke. Aloha and Cowa-flexit! 2 Comments on "Sweet new Pendoflex for Sir Lantzalot"
Speed, Glide and Slide – back on my twinnie for summer and having mo’ fun. I can only imagine the pop your boards must have on a nice roundy to rebound – looking forward to owning one when I get the cash. 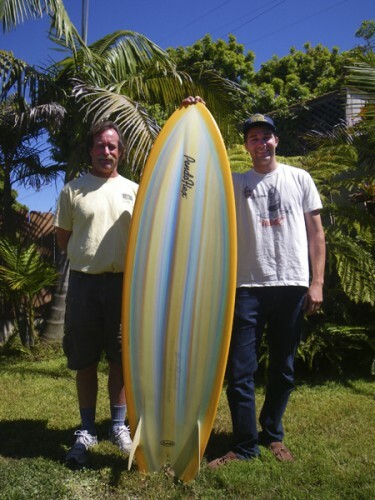 Keep up the great work Steve – you make beautiful boards! Aloha, Jack, thank you for your note.